Sin is sin no matter how we categorize it, but the sin that matters most is intentionally denying God and refusing to accept Jesus Christ as Savior. This also includes blaspheming the Holy Spirit (Mark 3:29). The consequence of this sin is eternal death. But what about those who don’t know they are sinning against the Trinity? Jesus not only had something to say about the person committing this type of sin, but he also had something to say to the forgiven person. Jesus often taught in parables. It was his way of speaking truth without overtly speaking the truth or calling out specific individuals. He would speak in parables, and the Holy Spirit would reveal bits and pieces of what Jesus was saying to exactly who it needed to be revealed to. In one particular parable about the Lord’s coming, Jesus spoke of a master who was absent from his home for a period of time and the servant’s actions while the master was away (Luke 12:35–48). In the parable, Jesus said that the servant who knew exactly what was expected of him should do what was right while the master was away and be ready for the master’s return. Jesus said some would choose to do other things—wrong things—and lose the trust of the master resulting in severe punishment. However, Jesus said that the servant who didn’t know but then did something wrong would be punished lightly (Luke 12:48). In a twist, Jesus said a more severe punishment would be levied upon the one who knew as opposed to the one who didn’t know. Some may say this isn’t fair. The ones who are saved and working unto the Lord have a higher responsibility upon their lives than those who are still wandering and lost in this world. Jesus said so. Lost people don’t always know they are lost, and until we stop treating the lost as if they know they are acting outside the will of God when they don’t even know God, our judgmental attitudes toward them will only push them further and further from Christ. For some unknown reason, God entrusts people to be messengers of the Gospel. His lost children are the “much” believers have been entrusted to reach and care for in Luke 12:48. God loves his much so greatly that he sent his only son for all the world (John 3:16). We hold the lost and unconverted to a biblical standard they know nothing about while at the same time violating the biblical standard we should know all about. Jesus held nothing back when He reached the lost. Nothing. He wasn’t afraid of what people thought or the standard customs of the day, and he didn’t care whether people would respond positively to the hope he extended. He loved anyway. The One who is the Word spoke the Word to all never holding back from anyone. The ones who responded were often those with childlike faith. They were the ones who knew their lack and need and knew the One who stood before them who read their mail as He read their hearts. Oh, if we all could be more like Jesus who focused on all the right things. 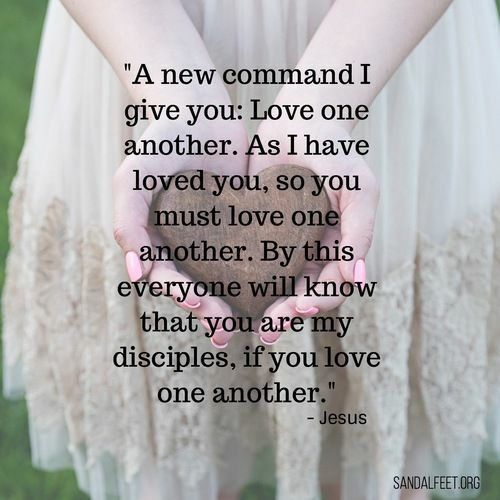 During his final farewell, Jesus gave the disciples a new commandment, “Love one another. As I have loved you, so you must love one another” (John 13:34). What would this love do? Jesus said that if they loved each other, it would prove to the world that they were His disciples (John 13:35). Jesus didn’t tell them right away to go out and love everyone. He started with their small circle. He said to the eleven gathered around the table, “Love each other.” If we can get love right within our small circles first, we have a much better chance of living love everywhere we go. Jesus’ love was apparent everywhere He went because He is love (1 John 4:8). He loved the disciples as much as any sinner or sick person he came across. He even loved all the religious leaders who wanted him dead. The miracles Jesus performed might have been the reason some initially followed, but it was His love that caused people to stick around. When you are with someone who has that much love for people, it is hard to stay away. For Noah’s wicked generation, God sent a boat. A boat is but a vessel made of wood with no ability to love. For our generation, God sent a person bursting with love. Jesus came from God the Father in Heaven who has a love we can’t even begin to fathom. God loved the world—this broken, sinful, dirty, and disobedient world—so much that He sent Jesus to save the world He created. No other prophet or king before Jesus could express this kind of love. Only Jesus could, and the crazy thing is, Jesus said that every single follower of Christ could and should love people the way He loves people. Do we utilize this amazing miracle to its fullest potential? Every once in a while, I find myself thinking about “what-if?”. What if Jesus hadn’t radically transformed my life and sent people into my husband’s life and my life to help us and disciple us? Where would we be now? Do you ever have these thoughts? I talked earlier about remembering where you came from but we also need to focus on the where we are going and why we are going there. Jesus said, “But seek first his kingdom and his righteousness, and…” (Matthew 6:33). We need to start our every day seeking God’s will. Very few things in life stand out as mile markers—you know, those moments in life where you can see a fork in the road so clearly and as you look back at that exact moment, you realize that God was there before the fork in the road, at the fork in the road and with you on whatever road was chosen. For us as a family, one of our mile markers is a man by the name of Mike Fechner. Matthew 6:33 was his life verse. In everything he did, he sought the kingdom of God first. He laid down his life for others—especially for those people who many would never take an interest in. Although Mike was from a predominantly white suburb and at one time a pastor on staff at a predominantly upper-middle class white church, Mike felt a burden for the people in the inner city. These were his people. Mike knew what it felt like to not feel welcomed. During his high school years, Mike’s father was stationed in Hawaii. While that sounds like a dream opportunity for most of us, it was a place and a time in his life where he experienced racial hatred. He was a “howlie” and the locals didn’t particularly care for howlies. God can and will use our pain and life experiences if we allow Him to, and God did exactly that with Mike. Mike knew the only thing that could bring people truly together was love. He was determined to love as many people as he could for as long as he could. Solely by a God-ordained appointment, my husband met Mike several years ago. Their first meeting took place shortly after Mike was diagnosed with Stage Four non-smoker's lung cancer. At the time of his diagnosis, the doctors gave him eighteen months to live (he ended up walking this earth for a little over five years after that first diagnosis). That God-ordained meeting led us to eventually see Mike share his testimony at the church where he was a former pastor on staff. That one meeting changed the trajectory and legacy of our family forever. And wherever my testimony is shared for my days on this earth, Mike’s name will be a part of it. His legacy of faith, endurance, perseverance, suffering and taking up his cross daily will live on long past my days. Mike’s life and legacy shifted the kingdom of darkness into light. Not because Mike was Mike, but because he was willing to be broken, bruised, battered and serve out of complete obedience and surrender to the Lord. We should all live with that mindset. We should be more consumed with pushing back the kingdom of darkness and ushering the lost into the kingdom of God. I know without a doubt Mike was ushered into the presence of God with the words, “well done good and faithful servant” because he sought the kingdom of God first. Mike was like a spiritual father to my husband, and Mike was a spiritual father to many others as well. He was the kind of guy that would give the shirt off his back for someone in need regardless of your age, color, or life situation. There isn’t a day that goes back that someone I know doesn’t mention Mike’s name. He was that kind of a guy. But you know what? We all can be that kind of person. We can all love better. We can all love differently. If we seek first the kingdom of God, we’ll know in our hearts there is room for everyone in His kingdom. Jesus said, "Make every effort to enter through the narrow door, because many, I tell you, will try to enter and will not be able to” (Luke 13:24). Right after that, Jesus said the door wouldn’t be open for very long. Eventually, the Master is going to close the door. The sad reality is that many people won’t ever enter the pearly gates of heaven. They will be banished into the abyss of hell and long-suffering. It’s not their fault necessarily. Maybe it is our fault. Maybe we aren’t sharing the Gospel enough. Maybe we don't love people consistently enough. Maybe we say we are “Christians,” but then we post or re-post ugly social media comments. Sometimes what we are feeling shouldn’t be made public. It should be taken directly to the One who can reconcile and cleanse our hearts. Because you are not witnessing, many have not heard the Gospel. They will be eternally separated from God. What a consequence of our apathy! It is time for us to put feet to our faith. Did you see what Watchman Nee said in his statement? He said that people would be eternally separated from God because of our apathy. He didn’t say it was because of God’s anger or judgment. He said it was because of us—Christians—who fail to do the work for any number of reasons. The crazy thing about God is that He chooses to use humans to be the carriers of the Good News. Jesus’ thoughts were always and will always be on eternal things and so must ours. If we choose lives of comfort over compassion, there will be consequences. People will die without reconciliation with their Father. They will leave this earth as a spiritual orphan even though the Father desperately wanted to adopt them into His forever family. We are never responsible for the outcome; we are only responsible for our obedience. We can’t force or coerce someone into accepting Jesus as their Lord and Savior. But God knows exactly who He is drawing to Himself through His Son (John 6:44). Christian, you and I have much work to be done in this world. There are spiritual orphans everywhere. They are hurting, lonely, sad, angry, depressed, and misguided—even if they don’t think they are. Be the hands and feet of Jesus and help this generation. Intercede for this generation. The Lord can heal our land, but it first starts with people. Love them where they are until they can figure out who they are in Christ. * Excerpt from Spiritual Orphans: A Generation in Crisis (Erin's upcoming book).